Is your kid suffering from red, pus-filled skin blisters that are painless but extremely itchy? Bullous Impetigo may be the cause behind the condition. Read on and know what is Bullous Impetigo, its causes, symptoms, diagnosis and treatment. 10 Is Bullous Impetigo Contagious? Bullous Impetigo is a medical condition marked by the formation of large fluid-filled blisters over the skin surface. It is a sub-type of a contagious skin infection known as Impetigo. The disease affects both adults and children but it is typically seen more in kids between 2 and 5 years of age. Bullous Impetigo Infections are characterized by the appearance of large vesicles on the skin of sufferers. Bullous Impetigo blisters can arise on different areas of the skin surface. However, they are more common on the arms, trunk and legs. One can also often find Bullous Impetigo on the buttocks. The cysts are usually swollen and filled with clear yellow-colored pus. In Bullous Impetigo pain is very rare. These blisters are usually painless. 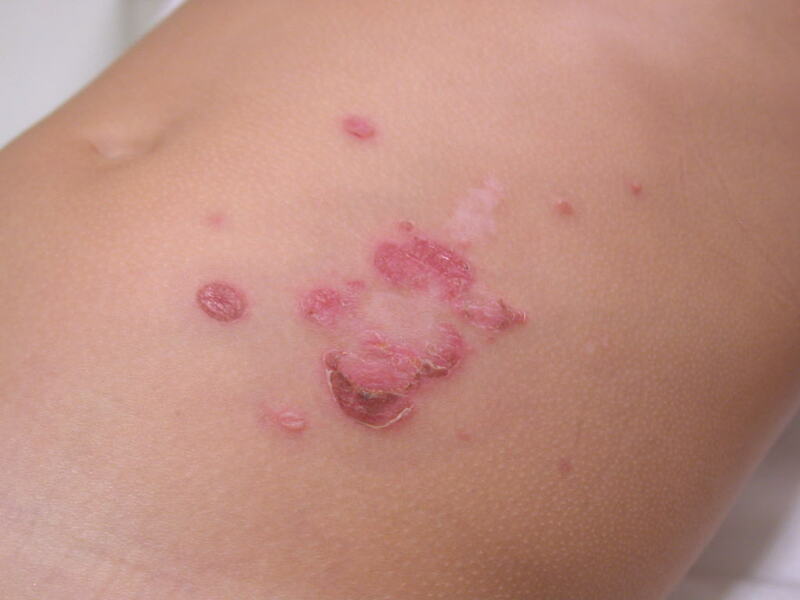 Bullous Impetigo rashes are delicate and rupture often. When the cysts rupture releasing fluid contained inside them, the skin region surrounding the blisters turns itchy and red. The blisters are initially covered with a yellow crust. In the final stages, it is common to find a dark crust forming over the blisters which eventually goes away as the affected person heals. Bullous Impetigo vesicles are generally caused by Staphylococcus Aureus bacteria. In some cases, Streptococcus bacteria are also a causative factor. In Bullous Impetigo bacteria produces a type of toxin. The Bullous Impetigo toxins reduce adhesion between cells which leads to separation between the upper skin layer or epidermis and the skin layer known as dermis located just below it. The bacterial infection is mainly attributed to the use of skin creams and diapers. The infection is also believed to result from sunburn. Bullous Impetigo lesions are also often thought to result from pressure on skin. Wearing tight fitting garments is often supposed to lead to Bullous Impetigo localized formation. Bullous Impetigo is generally detected by making an observation of the physical appearance of the skin. In some cases, a sample of the skin or lesion is taken and cultured to check whether there is any growth of Staphylococcus or Streptococcus bacteria. Bullous Impetigo is diagnosed if the results are found positive. The treatment of Bullous Impetigo involves use of antibiotics, Bactericidal ointments and anti-inflammatory medicines. In patients of Bullous Impetigo antibiotics are used in the initial stages of the disorder. Antibiotic creams are usually enough for destroying the bacteria and curing the infection. In advanced stages of Bullous Impetigo oral antibiotic medications like Flucloxacillin, Erythromycin or Dicloxacillin may be required. Bactericidal ointments such as Neosporin, Fusidic Acid, Chloramphenicol and Mupirocin are proved effective in treating mild cases of the disease. In Bullous Impetigo treatment antibiotics may be accompanied with anti-inflammatory medications may also be used to reduce swelling of the skin blisters. Gently wash the blisters with an antibacterial soap and water for several times a day. This helps remove crusts and prevent itchiness of skin due to drainage. It also prevents growth of bacteria and germs in the region. Mix a tablespoon of white vinegar to one pint water. Soak the blisters with a little of this solution and gently wash it away after 20 minutes. This helps loosen the scabs and remove them easily. If Bullous Impetigo appears in a localized region of the skin, it is important to wear loose-fitting garments that take pressure away from the skin surface. Bullous Impetigo often occurs and complicates due to touching abrasions and blisters on the skin with unclean hands. This passes on dirt and germs from the hand to the lesions and promotes bacterial infection. The incubation period for Bullous Impetigo is between 1 and 3 days. Bullous Impetigo is a contagious disease when it results from a bacterial infection. The infection can pass on to other people from physical contact. It is also advisable for the patient not to go out and mix with other people as it may transmit the disease. As the Bullous Impetigo syndrome mostly affects kids, it is better not to send them to school during the initial period of recovery. Bullous Impetigo rashes usually take a few weeks to resolve completely. However, Bullous Impetigo healing period can be longer if the infection is of a severe nature. Bullous Impetigo is a self-limiting disease. Naturally, it does not give rise to any complicated conditions. However, in some people an uncured Bullous Impetigo infection can lead to Erythema, a type of Impetigo. The skin surface should be kept clean and free from all injuries, irritations and abrasions. Any cut or blemish over the skin surface should be kept clean. Good hygiene helps keep a lot of skin infections and diseases at bay. Regular baths and washing the body with good soap prevents settlement and growth of bacteria. Want to know what does Bullous Impetigo look like? Here are some useful Bullous Impetigo photos that you can check out. Take a look at these pictures of Bullous Impetigo and know all about the appearance of the condition. If you find symptoms of Bullous Impetigo in children or adults in your family, call your healthcare provider and fix an appointment. Bullous Impetigo is a non-threatening disease but can cause severe discomfort to a sufferer for some time. It is best to let an expert medical professional alleviate the discomforts with proven medical methods so that your kid bounces back to health in a few days.